If you've been feeling a little restless, unsettled, or have been struggling to find a new focus, you just might be feeling the influence of a the moon once again. Today we move into a Full Moon in Sagittarius phase. In other words: caution, intense internal exploration ahead!! 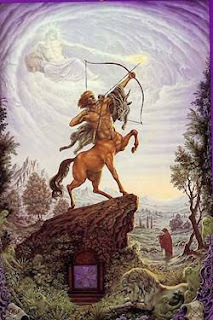 According to We'Moon 2012, the moon in Sagittarius gets us moving. We are restless and feel the need to move or explore, perhaps into the unknown, perhaps into the wilds of nature. This kind of Sagittarius energy provides a flow of energy and action that expands us past the ordinary boundaries to which we are accustomed. I've written about the energy of Sagittarius before and the connection to some Bach Flower essences that might be pretty helpful right about now. http://pixiedusthealing.blogspot.ca/2011/11/sun-and-moon-in-sagittarius-bach-flower.html If you are feeling too rushed and impatient to click on that link to the earlier post- let me give you a hint: you might feel the need for a bit of Impatiens today! Sagittarius is a fire sign. That signals transformative, intense, power and a energy that tests the boundaries and goes beyond. It is also considered a "mental sign", so the change and power of Sagittarius energy is often focused on philosophical things, changes of thinking, new concepts and methods of action. As if times weren't intense enough, this Full Moon is combined with a Lunar Eclipse. Unlike a solar eclipse, which often causes us to focus on society as a whole, a lunar eclipse is said to cause us to look closely within. So combine the fiery, philosophical energy of Sagittarius with that and you're likely to feel the need for internal change. Chances are you are more than ready to let go of something you've been carrying around for a long time. You might just be ready to totally change your thinking on something and embrace a new way of being. So while Bach Flowers can help you balance your emotions through some intense times, it might also be a good time to sit by yourself for a few minutes and let the powerful energy just move through you. Rather than fighting against the change we feel inside maybe it really is time to embrace new thoughts, engage in some introspection and let go of constructs, ideas, and responsibilities that no longer feel right for us. Under this full moon, consider what is holding you back. Maybe they don't really have to accept that hold. Maybe it's time to lighten up? In my opinion, nature is providing us with some powerful fuel at the moment. This kind of energy can help us think outside and beyond the box. There may just be a whole new way of doing things that makes you capable of meeting all your obligations, filling in all the details, feeling unconstrained in the process. The full moon is a time of insight and illumination. Channel that energy within, unbuckle your seat belt and enjoy the ride. "Sweet Shack & Bach Bar"
If you know what Bach Flower essences would be helpful to you, email Heather and indicate the essences (up to 6) you would like mixed in the 30ml remedy and provide a mailing address for shipping.